Another great day of celebrating Steam on the Road. We are looking forward to Sunday 7th October for the third annual Steam It Sunday. ‘Steam It Sunday’ returns on October 7th for the third successive year and with it the chance for owners and crew to get their respective engines out and about into local communities, small gatherings and museum courtyards. We all love a good road run, a decent rally or country show but all too often this means someone somewhere has to put in a great deal of work and usually expense to make things happen. Not so with Steam It Sunday, as it’s a free for all National event that is designed to showcase our hobby to all that stumble across us be they expert enthusiasts or complete strangers. In all honesty it matters not if you steam thy weekend before, or the weekend after – or even on a Saturday, the whole idea is to create a celebration of steam for all to enjoy. 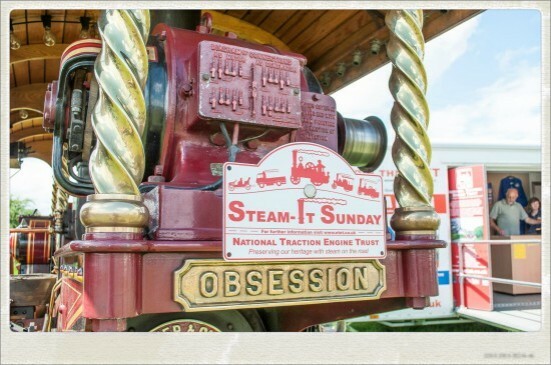 The day may well be being initiated by the National Traction Engine Trust, but it’s not about us, or any other organisation – it’s simply a day for all to come together and enjoy steam on the road. With ‘Drive It Day’ just a few days away and many engine owners taking the opportunity to take their engines out on the road, our thoughts here at the National Traction Engine Trust are looking a little further into the future and our own take on ‘Drive It Day’, ‘Steam It Sunday’. This year the event takes place on October 7th, and to help celebrate we have some engine plaques available for just £6 each. They look good on Engines, living vans, trailers, support vehicles – tractors, lorries, family cars, just about anything really (you’d struggle to get one on a motorbike and they are a bit big for miniatures as well). The second edition of Steam It Sunday was a fantastic success. Steam It Sunday is just around the corner. No seriously we didn’t have a clue as to how the first ‘Steam It Sunday’ would go. It was to be honest just a test, let’s put the idea forward and see what happens. Engines up and down the UK were being lit as the sun broke on a beautiful early Autumn morning and social media suddenly came alive, with the hash tag #steamitsunday. Slowly at first, but in much the same way an engines comes to live – things gradually picked up and it seemed that many hundreds of owners and crew, families and friends were up, running and enjoying the day. A fantastic effort by all, and we extent our thanks to everyone who made the day so special. It made no difference if you were a Trust supporter, member or hater (we only know of one engine owner who made it clear they were in steam but not for the Steam It Sunday event), or whatever. Everyone just got on with it, totally off the cuff, unorganised and just for fun! Just what the foundations of the hobby are all about. October 01st 2017, will see us do it all over again…….. we can’t wait! The inaugural ‘Steam It Sunday’ is being held on October 2nd 2016 and is a national event firmly based on the concept of the Federation of British Historic Vehicle Clubs hugely successful ‘Drive It Day’. The National Traction Engine Trust decided it needed an event where we all try and promote Steam on the road in it’s various forms, through a series of improvised and essentially free events organised at grass roots and local level, as it was done in the early days of the road going steam movement. Thus far we have heard of many gatherings up and down the UK, from Aberdeen to Hampshire and we are delighted with the response to the idea. Be it at local club level, regional society or just one man lighting his engine and going for a trundle the first weekend in October will be alive the sight, sound and smell of engines doing what they do best – being enjoyed. Whilst in an ideal world we would try and list every individual event being staged, such is the interest it would be a very time consuming and almost impossible task. With this in mind we encourage any enthusiast who wants to know more about local activities to contact their own local or regional preservation group or steam and vintage club, to see what may be happening in your region. You may also consider finding out about their own membership details while doing so. The Trust will be promoting as many activities on the day as possible via our own ‘Steam It Sunday’ Facebook page and of course our now long established main social media portal on Facebook, ‘The National Traction Engine Trust Page’. To assist in spreading the various word on happenings as it takes place we ask anyone posting information to use the hashtag ; #steamitsunday. This will enable us to post updates throughout the day and with luck make it the success it is on paper looking to become. 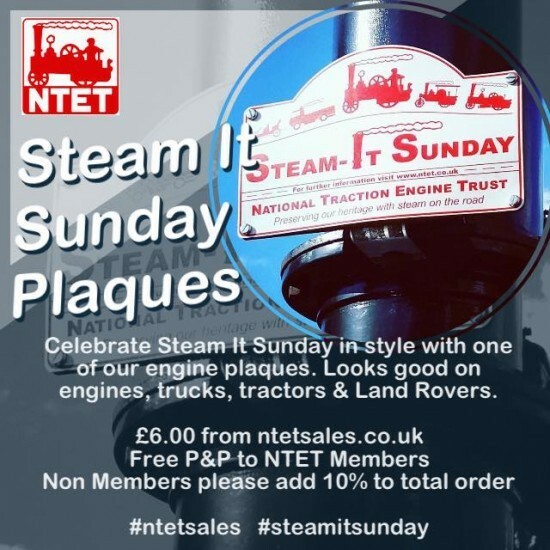 If anyone would like a memento of ‘Steam It Sunday’ we have engine plaques (which look equally as good on tractors, 4x4’s etc) available from our online store. Finally, we would like to thank everyone who has pledged their support of this the very first ‘Steam It Sunday’. As you would expect we hope it will take off and become a free for all annual event for everyone to enjoy and to highlight the fact that we are still able to drive steam driven vehicles of various design on our highways and byways. Priced at just £6 each, which includes postage and packaging they really do look good placed on an engine, Truck or support vehicle. Click here then 'Misc' to order. We were delighted to see that the Queensland Steam & Vintage Machinary Society in Autralia are promoting our very own 'Steam It Sunday as part of their own Running Day on October 2nd. For further details of the event in Queensland a quick search on Facebook will get you all the detail required. For more information on Steam It Sunday here in the UK, stay tuned to this website as we will be starting to really push the occassion once a certain event in Dorset is done and dusted.